Requirements for the defendant to actively participate in the English criminal process have been increasing in recent years such that the defendant can now be penalised for their non-cooperation. 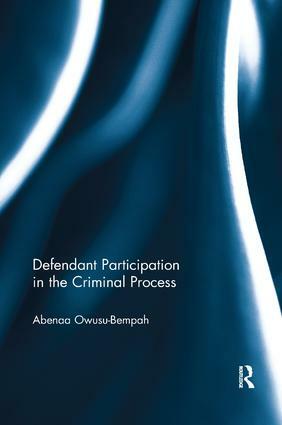 This book explores the changes to the defendant’s role as a participant in the criminal process and the ramifications of penalising a defendant’s non-cooperation, particularly its effect on the adversarial system. The book develops a normative theory which proposes that the criminal process should operate as a mechanism for calling the state to account for its accusations and request for official condemnation and punishment of the accused. It goes on to examine the limitations placed on the privilege against self-incrimination, the curtailment of the right to silence, and the defendant’s duty to disclose the details of his or her case prior to trial. The book shows that, by placing participatory requirements on defendants and penalising them for their non-cooperation, a system of obligatory participation has developed. This development is the consequence of pursuing efficient fact-finding with little regard for principles of fairness or the rights of the defendant. Abenaa Owusu-Bempah is Lecturer in Law at City, University London.